May is the month of the Virgin Mary. Below a chanson dedicated to Mary by Peire Cardenal & Raimon de Miraval (XIII century). 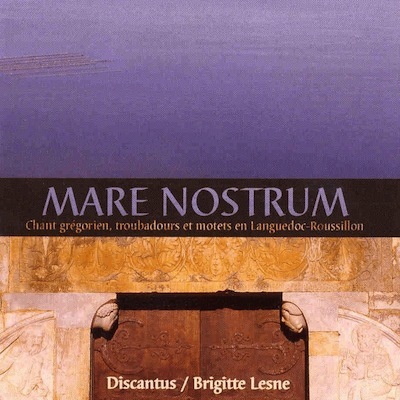 The text is taken from the leaflet of the record “Mare Nostrum - Chant grégorien, troubadours et motets en Languedoc-Roussillon”, Editions Jade, by Ensemble Discantus / Brigitte Lesne. The full text with some comments (it appears that the Ensemble Discantus recording skipped a few stanzas) is available on a website dedicated to the author. Per ta vera merce sia, qu'eret en me tos heres. Traita qu'ap to Filh me sia faita. Que'l calfa e clarifia, verais, de dreitura ples. Faita per tal maïstria: ses totz mals, mas ab totz bes. Tan fust de doussa paria, per que Dieus en tu se mes. Tu yest elha, ses falhia, non o pot vedar plaides. Traita que'm sia patz de Luy faita. In the name of your true mercy, I your true heir inherit. That there may be peace between me and Him. You are the dawn of day whose sun is you Son. Warming and illuminating, He who is righteousness and truth. Made for such perfection, free of all evil, yet blessed with all gifts. You were such sweet company that God descended to you. no man of law could deny it. Beseech Him that I may be at peace with Him.